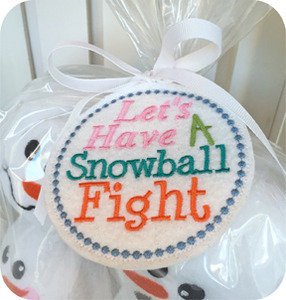 Our Snowman Snowballs will be THE gift of the season! Our original set of Snowman Snowballs was so popular we decided to make another set! 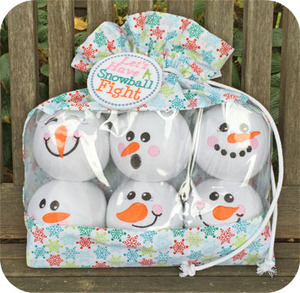 Let them have an indoor snowball fight with our softie Snowman Snowballs. Basic sewing skills are required to complete the snowballs & storage bag. The snowball is made using 6 panels. A printable pattern is included. Our snowballs turn out nice and round. The 'Let's Have A Snowball Fight' tag is made 'in the hoop'. You can package them many ways.